CLEAN TITLE CERTIFIED! This vehicle is at 1460 N Main Street Springville, UT 84663. Reviews: * Sporty driving feel that makes you feel secure while cornering; engines earn great fuel economy; spacious seating in both rows; many desirable safety features. Source: Edmunds * Introducing a feat of engineering previously thought to be impossible: the crossover without compromise. Not only does the CX-5 offer confident driving, all-weather capability, spaciousness and advanced features, but it does so with amazing highway MPG. CX-5''''s aerodynamic curves and sloping roofline reduce wind turbulence and allow for the vehicle''''s weight to be distributed toward the rear axle for increased stability. CX-5 is packed with advanced features that adjust to your driving needs, such as available rain-sensing windshield wipers, heated side mirrors, and 17 to 19 inch aluminum alloy wheels fitted with all-season tires. CX-5 features two transmission options: the ultra-responsive 6-speed manual and the 6-speed Sport automatic. 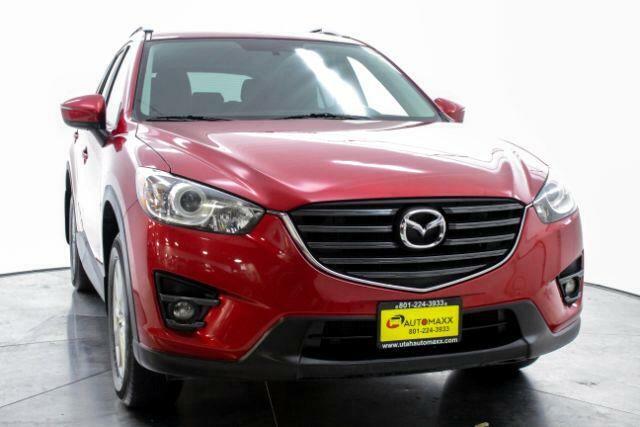 2016 Mazda CX-5 Touring --- All vehicles come with a 12 month/12,000 mile Powertrain WARRANTY for your PEACE of MIND! --- www.utahautomaxx.com --- 801-224-5333 Se Habla Espanol.